Were There Any B&L Hardbound Titles? 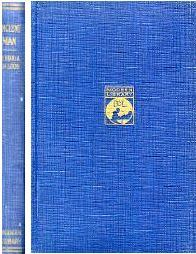 The earliest Modern Library titles (1917-1925) were all published by Boni & Liveright. B&L used imitation leather for the bindings (described in a related FAQ). But for a short period in 1924 (perhaps earlier), the publisher used a harder material. This temporary binding was composed of a dark blue cloth over stiff boards. The binding type, shown left (but the color in the image is lighter than actual binding color), was the same as Toledano binding #2 & #3 with Brodsky endpapers but with no top staining to the book block. ML scholar Barry Neavill speculates that this temporary binding was used during a shortage of imitation leather. The paucity of examples lends credence to the idea that the shortage was temporary. 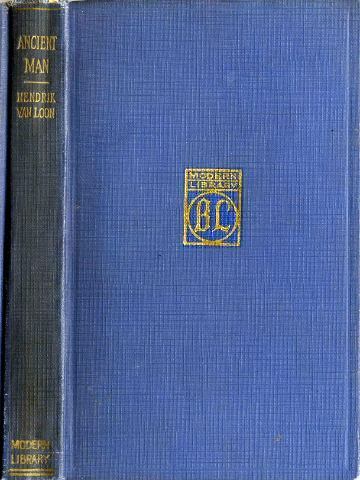 Copies spotted include Van Loon's Ancient Man (two examples shown left), Wilson's Addresses, Hudson's Green Mansions, and Yeats's Irish Fairy and Folk Tales. For detailed illustrated discussions of binding types, see Quick Guide to Regular Binding Styles.